Yet another successful Pinterest recipe to add to the books. Either I’m becoming a better cook or I now have a knack for finding the easy recipes. The latter being where I’m leaning on this one. Either way, I’m happy! I added a few things and switched out some ingredients for healthier ones from the original recipe I found and also added a lemon-dill-sriracha remoulade. Intrigued yet? In a small pot over medium/high, heat broth and quinoa to a boil, cover, reduce heat and simmer for 15 minutes. Once done, remove cover, fluff with a fork and let set for another 15 minutes to cool and absorb remaining water. While the quinoa is cooling, start mixing together the ground flaxseed with 3 Tbs water in a small bowl and set aside to thicken. To prepare the remoulade, place all of the ingredients in a blender (I used the magic bullet) except for the dill, and blend until smooth. If your mixture is too wet, add a few cashews and blend again. Likewise, if the mixture is too thick, add a little water at a time until desired consistency. Stir in the dill by hand. Taste. Add more of whatever you like while blending by hand. Cover until ready to use or keep in refrigerator. For the quinoa cakes – in a medium bowl, combine the quinoa, flaxseed mixture, flour, onion, celery, bell pepper, and garlic. The mixture should be moist enough to stick together, remaining slightly tacky. Add additional flour or water, 1-2 Tbs at a time if needed to adjust consistency. I had to add quite a bit more flour to get the cakes to stick together. Season with salt and pepper. Form into about 8-12 patties. I ended up getting a little more than this. Preheat oven to 200 degrees. Heat a drizzle of olive oil in a large skillet over medium heat. Add the patties and cook, w/o touching them, until nicely browned on one side, about 4-5 minutes. Flip and cook the other side for an additional 4-5 minutes. Keep finished quinoa cakes on a wire rack over a baking sheet in the preheated oven until all cakes have been cooked. Place the hot quinoa cakes with a generous dollop of remoulade and pair with a steamed vege of choice. Mine was asparagus and green beans :). One thing to remember that I did not account for when making the sides, was cooking the quinoa cakes in the skillet will take quite a bit of time. I could only cook about 3 at a time, and at 4-5 minutes a side the time really added up on me! And there you have it! A delicious meal, that was just as good reheated for lunch the next couple of days! I did it! I’m still alive to report that I successfully finished the first long run in my modified, very shortened version, half marathon training schedule. I ran 10 miles in 1:38:10, which comes out to almost a 10/mile even. I was hoping to finish the half marathon in under 2 hours or with a pace of about 9:30/mile, which I’m still not counting out! It’s just going to be an awful lot of work to pick up that kind of time in 4 weeks. I guess it’s just another challenge, right?! If there is one thing I have learned from training for this race, it’s that what you put in your body can make a world of difference. I’ve always eaten pretty healthy, but it was never to any extreme. It was mostly just because I genuinely enjoy fruits and vegetables. Unfortunately, I let myself cheat quite often on my diets and I never really saw the problem with grabbing a soda or candy every once in awhile (ok, ok probably once a week). Well I found another bandwagon and jumped right on! I am now following a “clean eating” diet and loving it! I can’t say that I follow it to an extreme or even all day every day, BUT what was I supposed to do with the food I had already bought before I decided to try this…I couldn’t just throw it out (nice rationalization am I right?). However, on a day when I have a long run, or really just even a run, I make sure to eat the right foods before I head out and it has honestly made big difference for me. I personally have a pretty difficult time getting enough protein in a day. I’m not a big meat eater, I can go without it for weeks and not even realize it, so I’ve had to make a conscience effort to take more in. I have done this in couple of different ways, but I want to share this totally awesome Power Muffin recipe I found through the Domesticated Academic. I changed a few things up in the recipe to reduce the calorie count a little bit…swimsuit season is right around the corner and all! Recipe makes 6 regular muffins. I did the math to find out the nutrition count in these muffins but now I can’t find where I put it, I’ll be sure to add that as soon as I figure it out again. Along with the muffins I usually try to make sure I have a banana some time before I go for a long run as well. Call me superstitious but this combo has made for some serious PR’s. 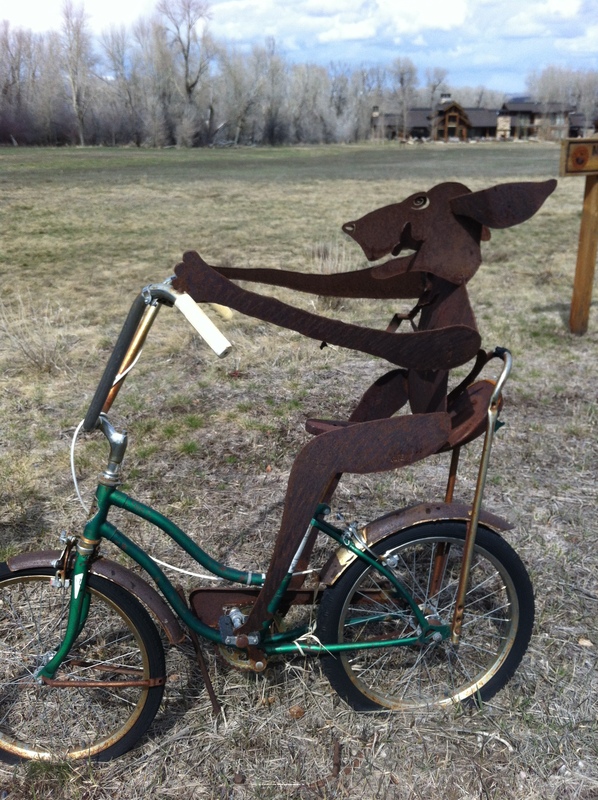 Just a dog…out on his daily bike ride. 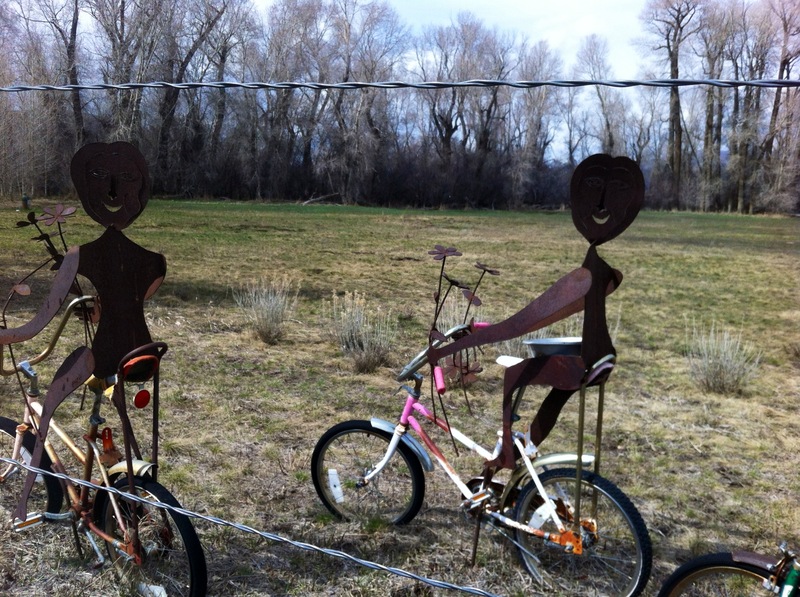 Wouldn’t you be this excited if you were on a bike ride with your dog! Oh boy. I signed up for my first ever half marathon and it is less than 1 month away! I think I probably could have timed that a little better but I really want to get my first one under my belt and I am fully confident that I will be willing and able to finish…and hopefully in good time. 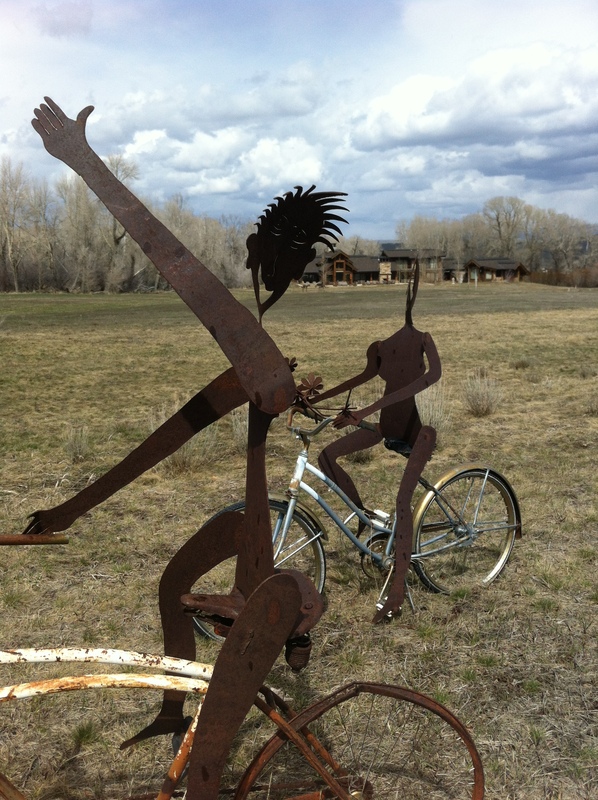 The race is called the Dino Half and is located in Vernal, Utah. It’s about a 2.5hr drive from Park City so I plan to head down Friday night. I don’t think waking up at 2:30am and driving 2.5 hours is a good way to start a race day. Anyway, I’m super stoked. It is an all downhill race and you lose about 1,500 feet of elevation in the process. 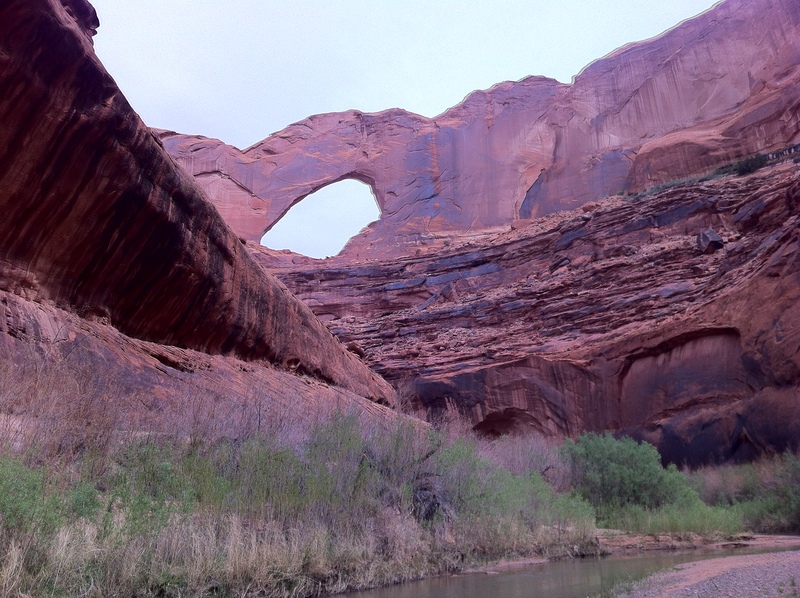 From what I hear you run through some of Utah’s most beautiful canyons and sandstone cliffs. I’ll be the judge of that 😉 Even though I only have a few weeks until the race (May 4) I still decided to follow a traditional 12 week half marathon training plan, I am just starting at Week 8. My first long run is this weekend, so it will be very interesting to see how that goes! Like I said, so far so good! But we’ll see how I’m feeling Sunday night after my first 10 miler in a LONG time! I think the last time I ran 10 miles was last Fall before Winter came. So in other words, wish me luck! Fun little tidbit about me, a couple of years ago, back in high school for some reason that I still do not know to this day, I started calling myself SarahTops. So running the dino race and my first medal being of a dinosaur could not be more perfect for me! I think it is part of the reason I am so freaking excited! Living in the mountains is usually a wonderful thing, but lately I have just had it with the random cold weather and snow storms. So I decided that if Spring wasn’t going to come to me, I was going to it. It took some convincing to get my boyfriend on board, but I finally got him to agree to head South! 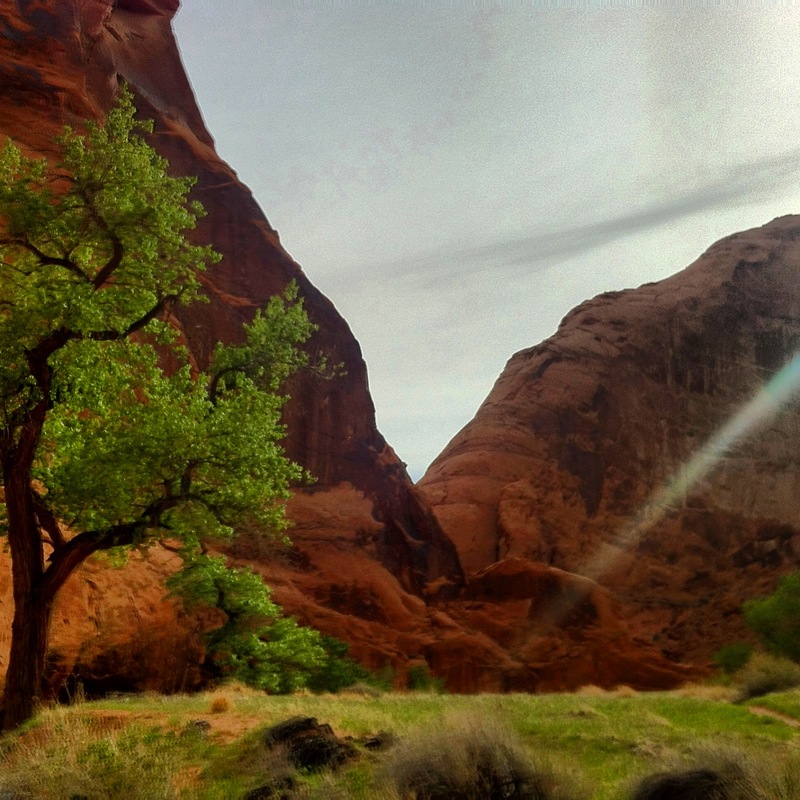 Southern Utah is full of desert and warm weather, so in the Spring and Fall it is an incredibly beautiful place to visit and get away from the dreary weather up here. It is actually where I am going to be running my first Half Marathon next month, but more on that later. We went on some of the coolest, most incredible hikes I have ever been on. 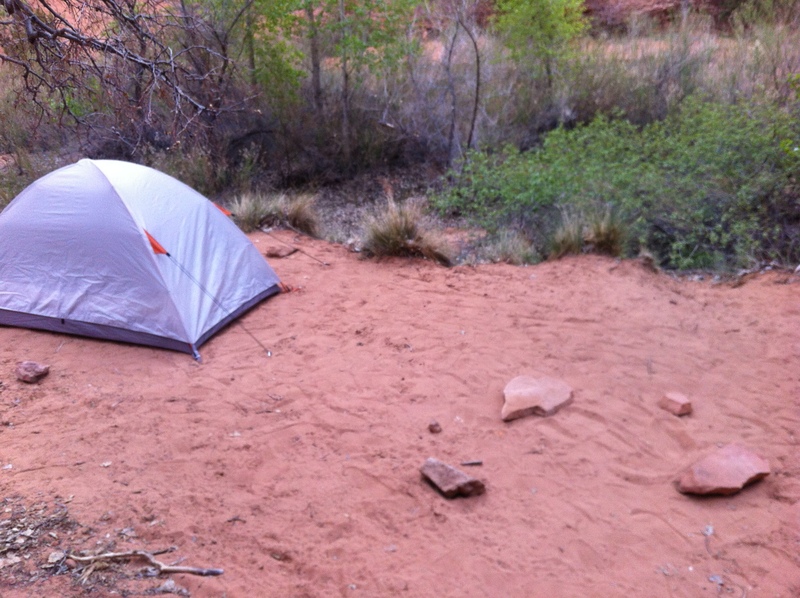 We headed down to St. George, UT early Saturday morning. But not too early because we both assumed the other one set their alarm soo of course, no alarms went off that morning 🙂 Oh well, we eventually hit the road and still made it down in good time. 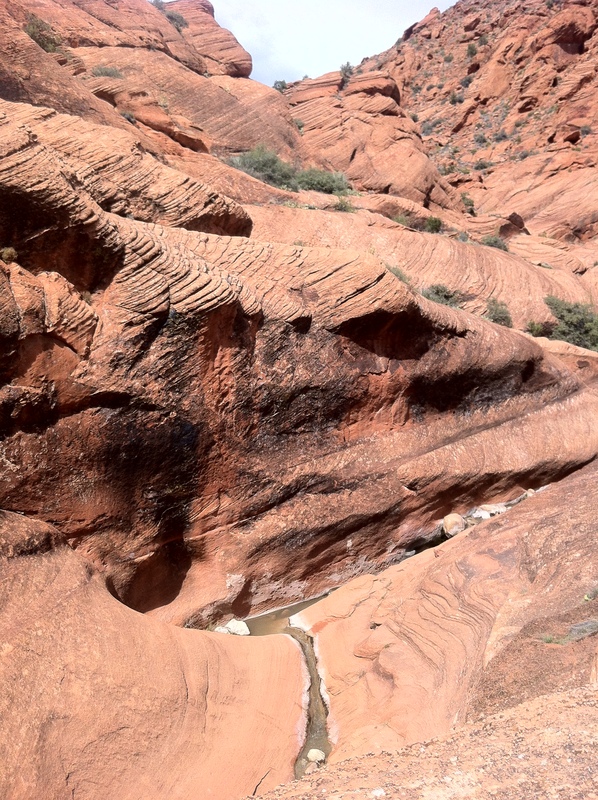 Saturday afternoon we hiked a place called Red Reef Trail right outside St. George. It was by no means a strenuous hike, but it was seriously amazing. It was full of natural pools and waterfalls running through the canyon and people were even swimming in them. 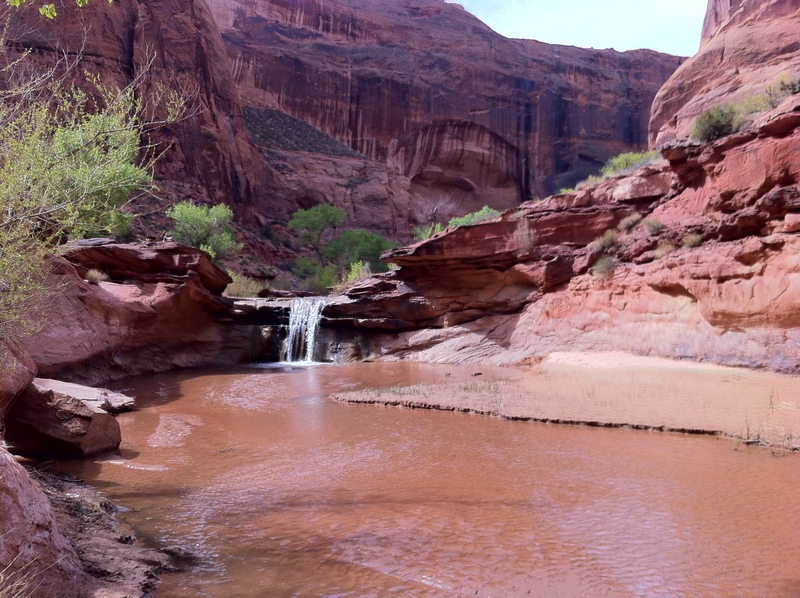 It was nice because the further up the canyon you went, the less crowded the pools were. The adventurers that we think we are ended up walking through belly button high water at points that was as cold as spring water if not colder. Finally getting that tan I’ve been waiting for! 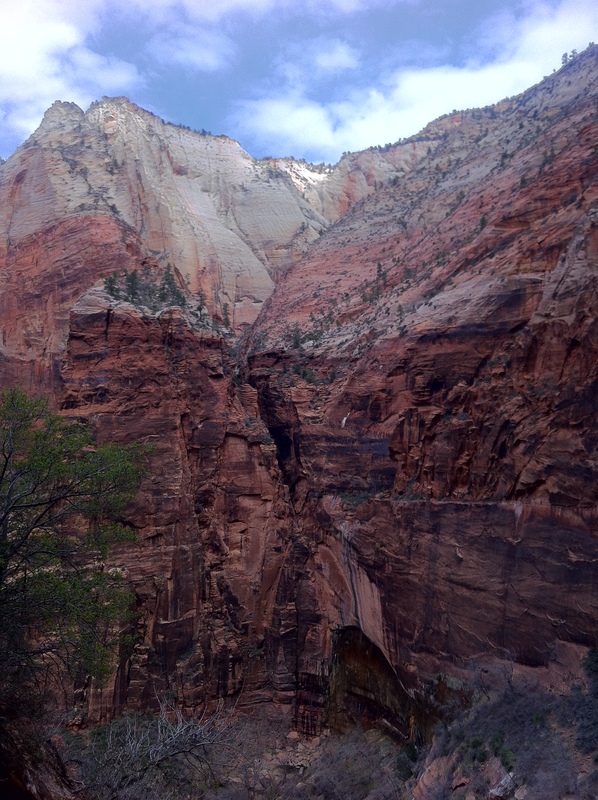 On Sunday we went over to Zion National Park which is also in Southern Utah. This was my first time visiting Zion and it certainly will not be my last! Just driving through the park up to the hike we chose was mesmerizing. 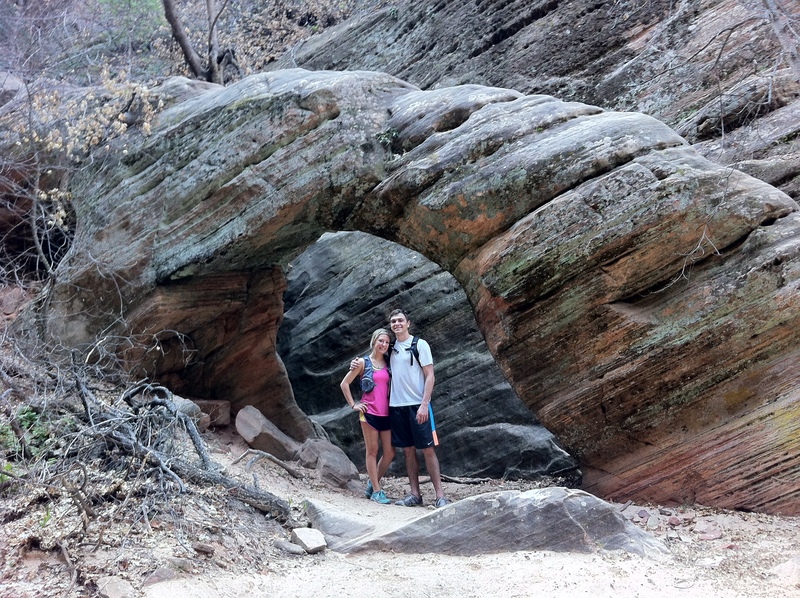 We hiked a trail called “Hidden Canyon”. While it is technically classified as a strenuous hike, I think that was only because of the big elevation gain at the beginning. This particular hike wasn’t on any of the Zion maps but we read a pretty detailed description of what we would see, encounter, etc. The description says that you will eventually come to a natural arch and that that’s a pretty good place to turn around. Well, surprise surprise, two people that can’t even figure out how to set an alarm missed the arch and hiked hours and miles passed it. 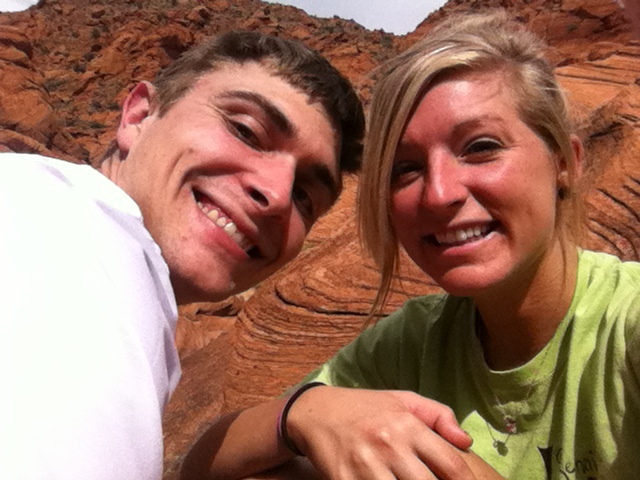 Neither of us could really complain though because the hike we did after we passed the arch was so much fun. And hey, we eventually found the arch on the way back and even got a picture to prove it. See, we eventually made it! AND we both did it in our New Balance Minimus Trail shoes! While we may have hit a few minor hiccups along the way, I wouldn’t have changed a thing! I had one of the most incredible weekends I’ve ever spent in Utah. I would absolutely recommend visiting Southern Utah to anyone who has the chance.